Everybody has seen pictures of UNESCO World Heritage Site Hạ Long bay, with its karst rocks swathed in atmospheric fog jutting out of the South China Sea. Although it’s impossible to deny its incredible beauty, what the travel agency photos don’t show you are the eddies of plastic water bottles bobbing in the sea, or the plastic wrappers left at the beautiful beaches. 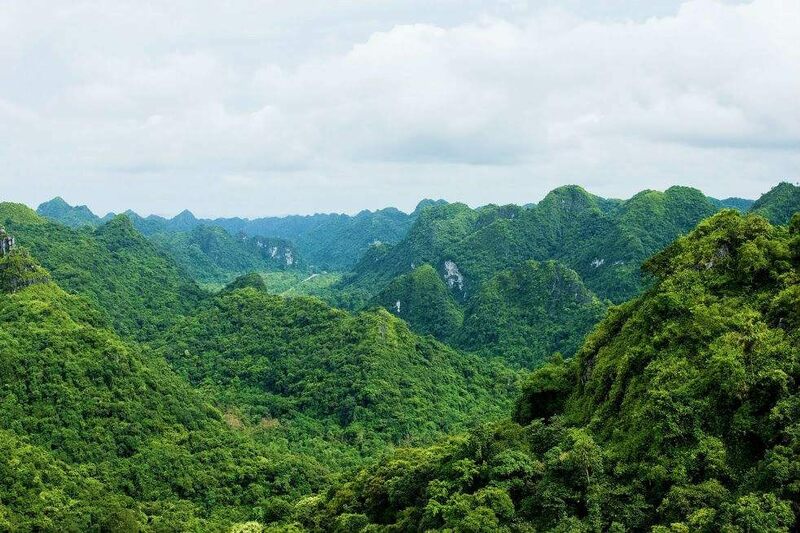 Beaches which throng with tourists and monkeys who steal half-smoked cigarettes or shake the last drops out of beer cans, all with the inevitable background of Vietnamese techno music. It smacks of natural beauty gone sour, an instagrammable masterpiece which hides a grimier reality. South-east Asia has a well-known litter problem which hails from traditional packaging materials being made of natural biodegradable materials. Once plastic arrived with its superior durability and strength, it was embraced with open arms. But, without government initiatives to highlight plastic’s inability to biodegrade, the population treated a plastic bag in the same way they would treat a banana leaf; by discarding it wherever they saw fit. I’m not trying to dissuade you from going to Hạ Long bay, it is just as glorious as the pictures. 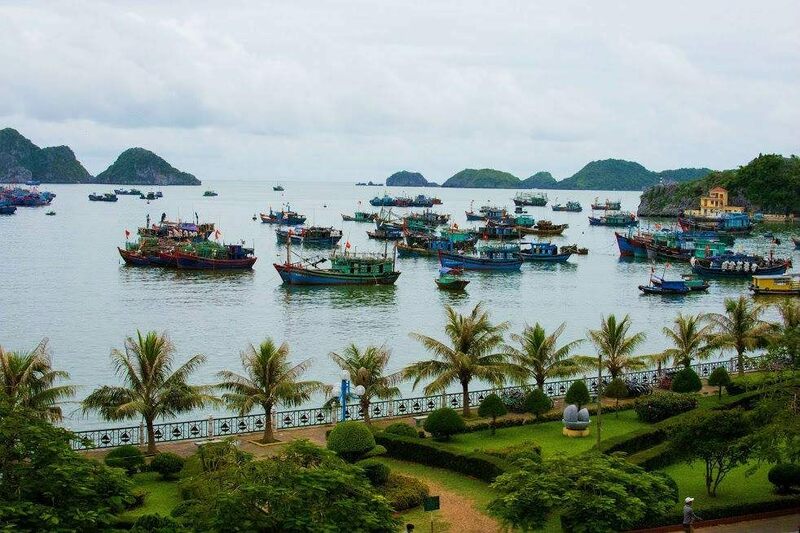 However, if you want to escape the tourist traps and find some cleaner, calmer waters for a lot less đồng, Cát Bà island is a much better option with more opportunities to see a more authentic Vietnam. Cát Bà town can be reached by bus from Hà Nội via Hai Phong, where you have to switch buses and then get a boat across the water. The drive to the town skirts the island, with rocky mountains and crags enveloped in wild jungle on one side contrasting with the slate blue sea on the other, before cutting through the middle of the island with green as far as the eye can see. The town itself is underwhelming at first sight, with a main drag that follows the bay and is lined with unremarkable hotels (khách sạn) charging $8-$15 dollars a night. In the early evening though, the town comes to life, with plastic chairs strewing the concrete, children playing on their shiny balance wheels or go karts -have a go if you’re brave enough- and, most likely, some pumping Vietnamese music. It’s a popular tourist destination for Vietnamese city-dwellers, and caters for all needs with neon-lit clubs sticking out like a sore thumb next to old biddies selling sugarcane juice (nước mía đá) in hammocks on the street. We snuck into a school playground, attracted by the thumping of drums and shouting. A group of kids were practising dragon dancing, with their teacher barking orders from the sidelines. It was refreshing to see teenagers laughing and joking with each other, their teacher and even us, via some high quality miming and my laughable Vietnamese. We took a walk around the town, over the bridge and into the port area where the atmosphere changed palpably. The tourist hum disappeared and the bars (bia hơi) were full of men with calloused hands clutching their beers or taking shots of rice wine, the national liquor. As is often seen in Vietnam, as the men drink beer or play chinese chess, there is inevitably a woman close by picking up the slack. A group of women were hauling an unfeasibly large amount of net out of the water, and sensing interest, they roped us in to help. Gloves donned, we realised the ridiculous weight of the nets, and once again felt in awe of the strength of these working women. To see the beautiful waters of Hạ Long and the fantastic floating villages, we took a boat from the nearby Bến Bèo harbour. We rented our own for the day, and our driver (sailor?) took us through the floating villages to get to the more open sea. The floating villages are owned by fishermen and their families, and due to the rise in land tax, find it impossible to afford a life on the island itself. The houses are wooden and brightly coloured, and there is even a floating store for them to pick up their essentials. Most families have dogs, which pick their way delicately across the wooden boards, and are reputed to be food insurance for when the fish stocks run low. The boat eventually left the village behind, and the sea awaited us, the famous rocks looming over us making us feel small and insignificant. A solitary kayak trip where we ended up taking an unplanned detour was very good exercise, and a swim in an abandoned sandy spit between two islands allowed for the discovery of some beautiful shells and some water dodging of just a touch of polystyrene. No loud tourists, no piles of water bottles, and most importantly, no bass-heavy tuneless thumping. Just the sound of the waves, the birds and the wind whistling through the rocks.